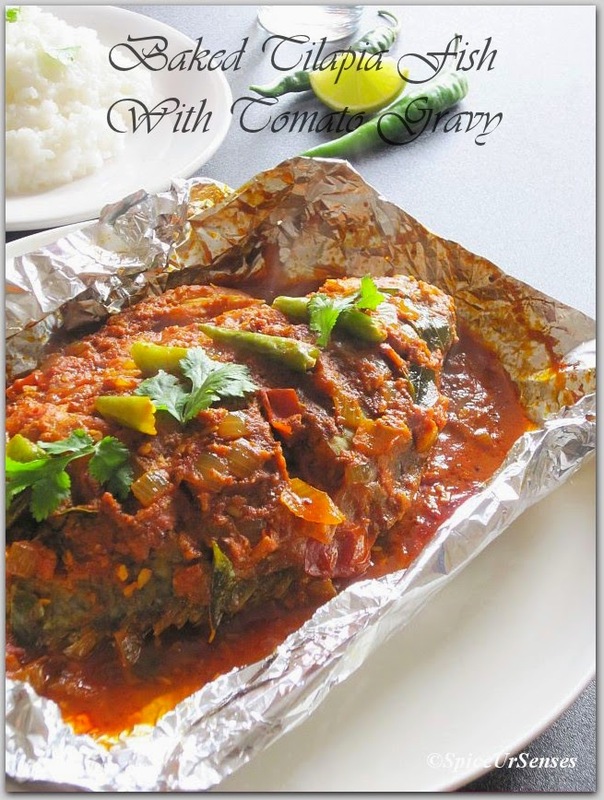 Baked Tilapia Fish With Tomato Gravy/ Meen Pollichathu. 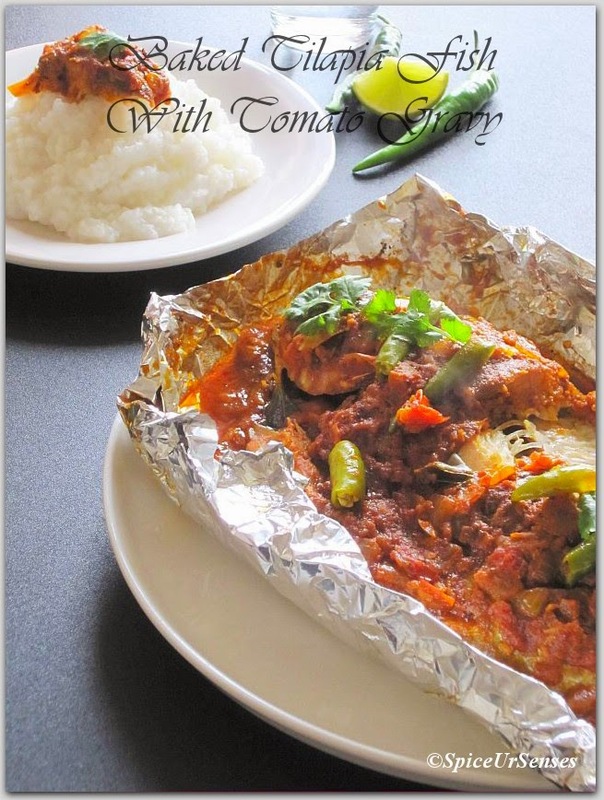 Baked Tilapia Fish With Tomato Gravy. 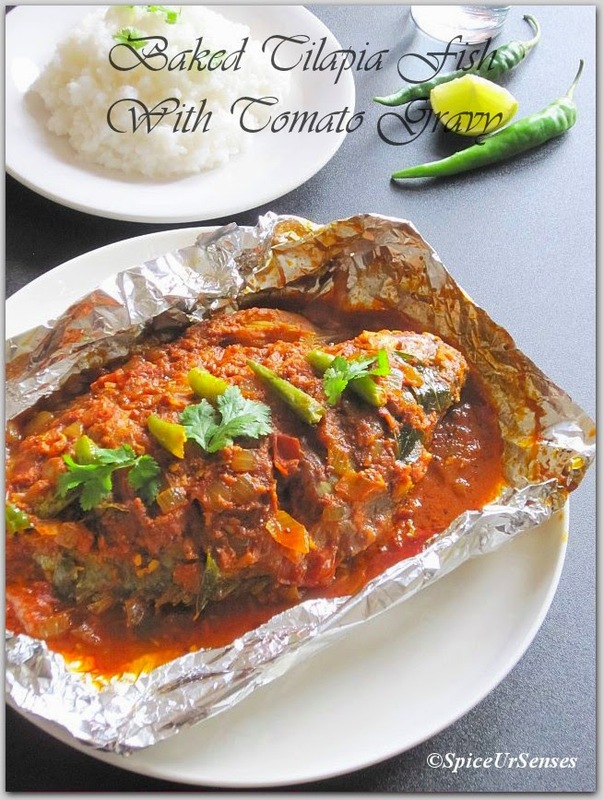 This is a very famous kerala dish called Meen Pollichathu. Meen Pollichathu is basically fish covered with a spicy masala and wrapped in banana leaves and shallow fried. But since I did not find banana leaves here, so I wrapped it with foil paper and baked it to give a healthier touch. And I have made a little changes in masala too by adding more tomato's to have a little gravy. It is all up to us to add or remove the ingredients according to our taste and it taste as good as the traditional dish. This can be served with rice, roti and even as a side dish. Ingredient's to marinate the fish. Clean the fish. Make gashes on both the sides. Add all the marinated ingredients into a mixing bowl and make a thick paste by adding little water. Then apply it nicely on the fish and set it aside for atleast 30 minutes. In a tava add oil and fry the fish both the side for a minute or 2. In a deep frying pan, add oil, when oil is hot, add curry leaves and mustard seeds, when they splutter, add onion, green chilli and fry to lite brown. Add red chilli powder, turmeric, coriander powder, garam masala and ginger garlic paste and fry for 1 minute. Then add chopped tomato's, coconut milk, coriander leaves, lemon juice, salt and cook till the tomatoes are well cooked. Allow the masala to cool. In a mean time pre-heat the oven at 200c for 10minutes. 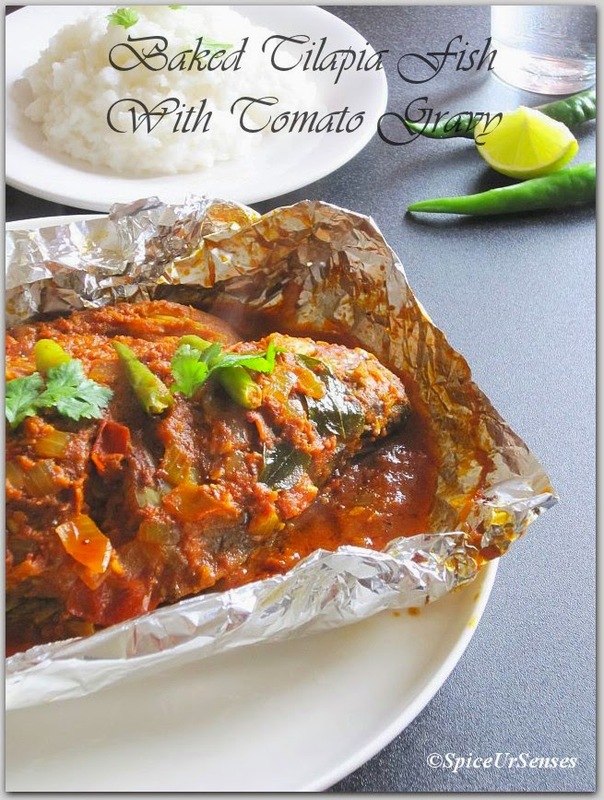 Take a large foil paper, spread some masala on it. Place the fish over the masala and spread some more masala over the fish. Fold the edges and secure. Then baked the fish for 10 to 15minutes. Serve hot with Rice, Roti or as a Side Dish. 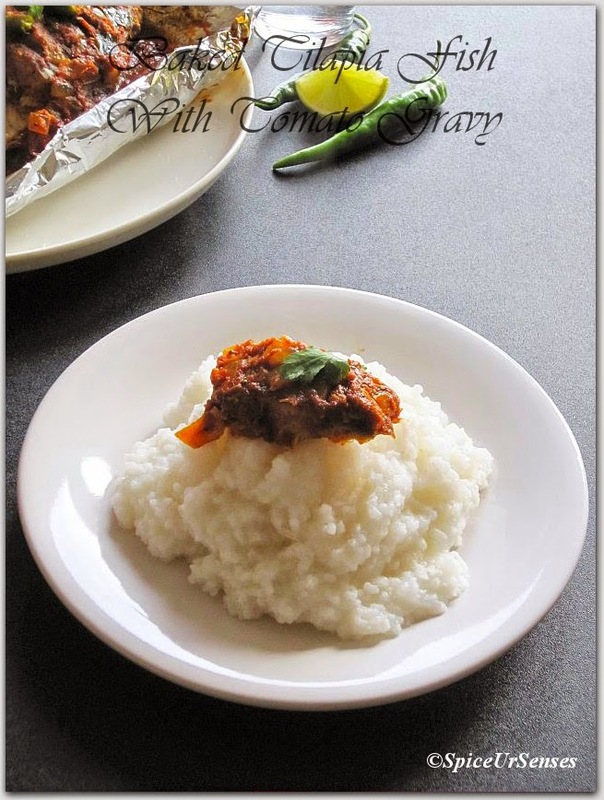 wow.. mouth watering recipe... bookmarked..
looks delicious very nice dish. Scrumptious dish and it turned out very well..
Wow u have made it well with Tilapia really tempting pics we usually make it with pearl spot in plantain leaf. Lovely recipe. looks so saucy and good.